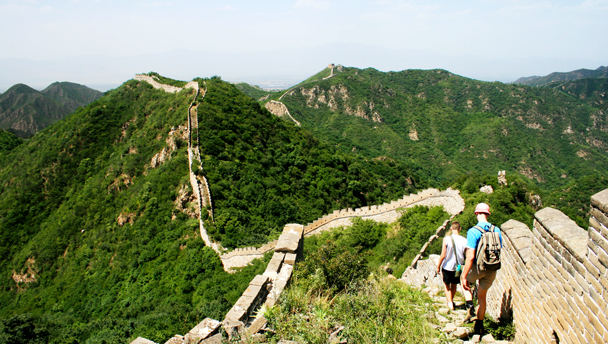 Hikers following the unrestored Great Wall in Yanqing District. 4–5 hours start to finish over about 9km. Dragon Boat Festival holiday hikes—We’re leaving early to get ahead of the holiday traffic, but we still may get stuck in a jam at some stage. Bring a book or something else to keep yourself entertained, just in case! Travel right on past touristy Badaling on the way out to a difficult Great Wall hike in the mountains overlooking the Guanting Reservoir in Yanqing. The climbing is steep and tough and we’ll take 4–5 hours to complete the 8km walk. For much of the hike we’ll be quite high up, peaking at 1,200m near the midpoint where the wall curves in a sharp switchback. We have a shorter version of this hike – on this trip we’ll do the tougher, longer route, and we’re going to do it backwards! Midway through this tough hike the wall doubles back on itself in a sharp switchback, and that’s why we named this area the Switchback Great Wall. The local name is a little different: the Hunchback Great Wall! We’ll drive up into the hills and start the hike by climbing up on to a tall ridge to reach the Great Wall. We then follow the wall up to the “General’s Tower”, one of the biggest towers in the area, and likely the location of the commander in the area back in the Ming Dynasty. From here we’ll be able to see why it made such a good command post – the views are amazing! After the General’s Tower, the condition of the Great Wall here deteriorates, and as we continue we’ll have some tricky descents on slippery, broken down sections of the wall – not much fun if you’re not good with balance or don’t enjoy heights so much. The Great Wall leads up to towers that are even higher up than the General’s Tower, and just after the highest point we’ll reach the switchback section, repaired in 2015 in a restoration project. Also nearby is a rundown radio tower, accompanied by a tiny hut – a short detour if you’re interested to take a look, and the trail is not too overgrown! After we pass the switchback section there are a few more steep ups and downs before a long descent along the wall – again, there are some tricky sections here, and we’ll need to be particularly careful right at the end as the path gets quite slippery. The Great Wall dips down into a valley, and that’s the end of the hike. A short walk on flat ground takes us to a narrow road, where we’ll find our bus.